Guernsey Welcomes the Olympic Torch! A beautiful day and a crowd of up to ten thousand welcomed the Olympic torch to Guernsey yesterday, as a team of 15 torch bearers carried the Olympic flame to the centre of St. Peter Port. The Olympic flame was transported to Guernsey on Sunday morning, arriving at Guernsey Airport aboard the ‘Firefly’, the British Airways Airbus A319 that has been given the prestigious job of carrying the Olympic flame over the seas. The relay began at 9am sharp, as local Channel swimmer Roger Allsopp, the oldest man to swim the channel, set off from Guernsey’s South Esplanade to the popular attraction of Castle Cornet. From there the relay route followed the Esplanade and proceeded to take a small tour of St. Peter Port’s streets, being watched by thousands enjoying the carnival atmosphere and beautiful blue skies. The torch was carried across St. Peter Port’s harbour aboard a dinghy as local Commonwealth athlete Tom Hollingsworth stood and waved from the small deck. Guernsey’s Olympic cauldron was then lit atop Albert Pier, with celebrations continuing throughout the morning as the flame was whisked back to the airport for its short flight to the Jersey Olympic Torch relay. 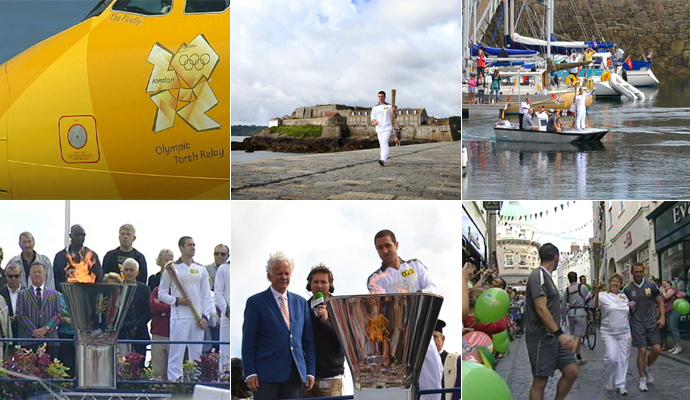 Visitors to Guernsey were treated to a glorious sunny day and a unique Olympic celebration to remember. Roger Allsopp, Michelle Kohlschein, Rob Smart, Jamie Bichard, Hannah Pearce, Andrew Harrison, Paul Radford, Paul Diligent, Manuel Helmot, Ross Allen, Susan Boalch, Johanna Norman, Thomas Hollingsworth, Luke Jones, Peter Beausire and Ella Hartley. This entry was posted in Guernsey News and tagged London 2012, Olympics. Bookmark the permalink.